Alfredo Brown is 21 years old. Per tradition, the total raised at Dance Marathon is announced at the end of the event. More than $60,000 was raised in 2012. He’s a sports management senior at FIU, and the president of Pi Kappa Phi. Today, he is a healthy young man, but he once was known as a Miracle Child. He was born three months premature, and among the problems he faced were a class 1 brain bleed, a small hole in his heart and underdeveloped lungs. The “all” he is referring to is more than just the 25 straight hours he danced alongside more than 300 other participants at the 15th annual Dance Marathon, the largest student philanthropy at FIU. He also means the months of organization and planning and, of course, fundraising on campus and at home. It all culminated Jan. 28-29 at Modesto A. Maidique Campus’ Recreation Center, with almost $61,000 in cash donations raised so far. This year, Alfredo participated as director of morale, helping to manage the event. He also has had the chance to speak with families who benefit from the event through Children’s Miracle Network. During his first marathon, he was a dancer, then rose through the ranks to become morale captain in his second year. The one thing he’s looking forward to the most in years to come? More dancers. 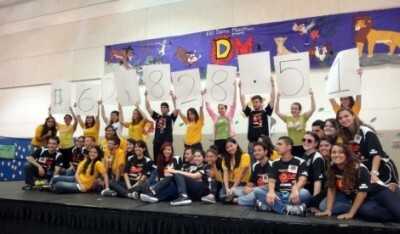 Donations to 2012 Dance Marathon are still being accepted through this site. Funds raised benefit the Miami Children’s Hospital Foundation through the Children’s Miracle Network.